"The Lonely Planet guide book descibed this place as 'less touristy' than Na Trang. It doesnt say 'you will be the only tourists in this place'. After waking and thowing back the curtains (remember we arrived in the dark), we were greeted by a beautiful view of Quy Nhon Bay of the the South China Sea. We headed off on a Xe Moto taxi (moped) to find the local booking office so we could get the next bit of our travel sorted. The booking office does not exist where the map says it should. However, we decided food was required and tried to go to a restaurant mentioned in the book and got into a taxi, who did not understand a word we said." 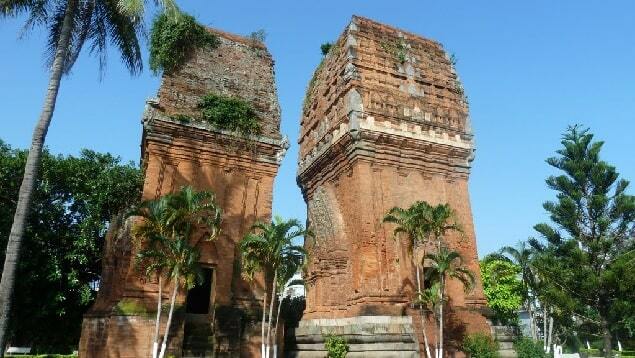 Quy Nhon - is a large, prosperous city on the coast. 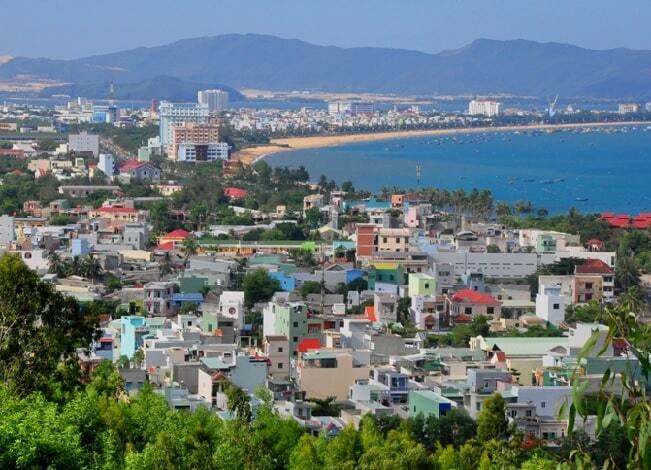 Quy Nhon is blessed with a beautiful coastline with sand and large boulevards. The streets of the coastal city are tidy and litter free streets make it a city, where wealthy Vietnamese elderly people like to spend their retirement. They want to spend their final days by looking at the ocean and walk the boardwalk back and forth. Quy Nhon is a very good city to have fresh seafood to eat, but for most foreign visitors to the city the sights of the city are less clear to see. But.... more and more tourists are coming! However, they are attracted by the Bai Xep, 12 km south of downtown. Since the last time many new guesthouses come. Young people are coming to this place. Bai Xep has developed into a fishing village with many nice guesthouses, which are located directly on the beach of Quy Nhon. A perfect place to stay since the mid Nha Trang (in the south) and Hoi An is located (in the north). There are long beautiful, sandy beaches and great opportunities for swimming or snorkelling. You can ideally relax, read, snorkel, or take a stroll on a deserted stretch of sand. Also a day of chilling in a hammock and enjoy a drink is possible, while watching the ever-changing colors of the boats, islands, sea air. 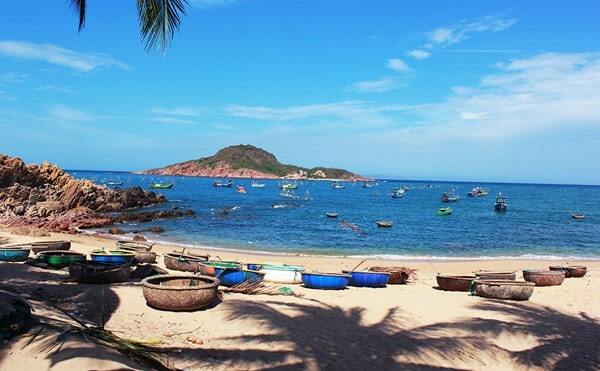 The length of Quy Nhon beach stretches from the harbor in the north toward the hills in the south of the city. It's a beautiful stretch of beach and it had in recent years a major facelift, thanks to Bai Xep. This makes it almost as nice as Nha Trang, but it has a fraction of the tourists who visit Nha Trang. The most beautiful part of this stretch is near the Saigon Quy Nhon Hotel (in the north). There are a lot of coconut trees along the boulevard. At sunrise and sunset the locals practiced here "tai chi". Along the coastal road to the south there is a park-like promenade, interrupted by big hotels. Here is the beach more beautiful and quiet, away from the bustle of the city. At night you see at sea the bright lights of boats, which are fishing for squid. The boats at sea give you the illusion of a floating village, far away at sea. 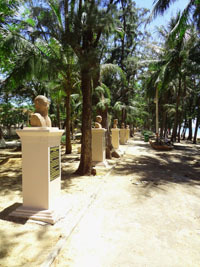 In the distance you see on a headland a giant statue of Tran Hung Dao. It is possible to climb up into the statue, if the door is open. You can then peek out through the eyes. A small square is dominating a striking war memorial. In the center of Quy Nhon is the 17 m high Buddha (built in 1972) hard to miss. Besides this Buddha is the entrance to the main pagoda of the city. 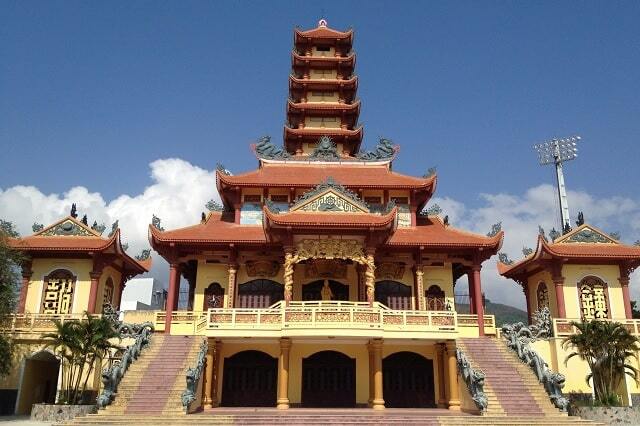 This old Long Khanh Pagoda has been commissioned by a Chinese merchant in 1715. The monks who live here, meet the religious affairs of the active Buddhist community of the city. A mosaic of dragons is made of broken glass. This is leading us to the main building, flanked by towers, a giant drum (left) and a huge bell. Inside is the large copper Thich Ca Buddha (with its multicoloured neon halo) and a drawing of the Chuan (the Goddess of Mercy. The many arms and eyes of the Goddess symbolize her ability to touch everything and see everything. At the Quy Hoa Beach & Leper Hospital you don't think of images of fun and enjoyment. Many will not visit this area, because it is fenced. Leprosy is almost impossible, but if it is still detected, and then they come here into a model village. Today there are not so many patients, but the descendants of affected families live here in a well maintained community. The village is situate at the Quy Hoa beach, a beautiful stretch of sandy beach and a popular weekend hang-out for the small expat community in the city. The hospital grounds are well kept, complete with numerous busts of distinguished and historically important doctors, both Vietnamese and foreign. Depending on their abilities, the patients work in the rice fields, in the fishery, or they help to repair companies. There is also a workshop here, where prosthetic limbs and special shoes are made. You probably need permission from the director of the institution to visit this section. Binh Dinh Museum is a small museum, focused on regional history. The entrance hall is aimed at local communism, including an interesting side pressure (Zuy Nhat, 1959). This small museum has a few good examples of Cham sculpture and pre-Cham pieces from the Bronze Age. A disturbing number of images of the Cham collection stand out randomly exhibited. Exposed to the elements - this is probably not the safest place for these rare artefacts. The two Thap Doi Cham towers are located in the city in a beautiful park. You need to climb steep stairs to get inside. The towers are open at the top, so you can see the sky and clouds. They date from the 11th century. In the bigger tower (20 meters high) you see at the corners torsos of Garuda's (half human, half-bird).